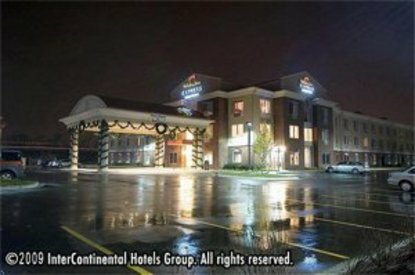 Welcome to the new Holiday Inn Express Hotel & Suites of Farmington Hills This beautiful property is centrally located in the business district of Farmington Hills off of I-275/ 8 Mile road. Major restaurants located with in a mile or two P.F Chang&regs china bistro, Bravo, Macaroni Grill, Baja Fresh, Bahama Breeze, Uno Chicago Grill, and Flemming&regs steak house. Other near by sites include AMC Theater, Maybury State Park, Novi shopping mall, Downtown Northville, Downtown Detroit, Palace of Auburn Hills, Ford and William Beaumont Hospital.Hotel features complimentary wireless/ wired high speed Internet access, free local phone calls, Smart Start Breakfast, Boardroom and meeting space available up to 75 guests. Our beautiful five acre property offers great escapes with packages designed for family travel or choose a romantic getaway in a spacious suite. While traveling on business or leisure you can earn 1,000 bonus points through Priority Club Rewards. Our professional & friendly staff looks forward to the opportunity to make your stay as convenience & enjoyable as possible. Visit our new location in the Detroit and Farmington Hills, MI and stay smart at the Holiday Inn Express Hotel. This hotel is committed to providing accessible facilities under the American Disabilities Act. If your accessibility needs are not met, please contact the Hotel Manager on Duty. Should you require additional information regarding accessible facilities for guests with disabilities, please call 1-800-Holiday (U.S. and Canada) or contact the hotel directly. For the hearing impaired, TDD service is available at 1-800-238-5544 within the U.S. and Canada.